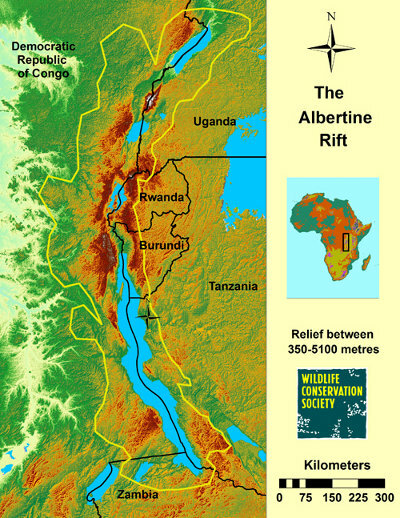 The Albertine Rift or Africa’s Western Rift Valley is one of the most biodiverse regions of the African continent. With more than half of Africa’s birds, 40% of Africa’s mammals and about 20% of its amphibians and plants, it contains more vertebrate species than anywhere else on the continent. It also conserves more threatened and endemic species than any other region of Africa, and as a result is a Biodiversity Hotspot, a Global 200 Ecoregion and an Endemic Bird Area. Human population density in the Albertine Rift is also high with over 1000 people per square kilometer in some areas of the Rift, with some of the poorest people on the continent. It has been a region of great conflict over the past 40 years with civil wars in Uganda, Rwanda, Burundi and the Democratic Republic of Congo (DRC). Only Tanzania has escaped this conflict in the Albertine Rift. This juxtaposition of high human population density, high levels of poverty, conflict and high biodiversity means that there are many challenges for conservation in the region. The Wildlife Conservation Society (WCS) has been active in the Albertine Rift since 1959 when George Shaller made his pioneering studies of the mountain gorilla. In 2000 WCS established the Albertine Rift Conservation Program which works throughout the region to support the protected area authorities in all five countries in the Albertine Rift, the only conservation NGO to be active at all sites. In each country we partner with the national protected area authority, notably the Uganda Wildlife Authority (UWA), National Forest Authority of Uganda (NFA), Rwanda Development Board (RDB), Institut Congolais pour la Conservation de la Nature (ICCN), Tanzania National Parks (TANAPA) and the Institut National pour l’Environnement et Conservation de la Nature (INECN) in Burundi. We also partner with many other national and international NGOs as well as Universities at various sites.